PRDM16 translocations in 5 leukemia cases. (A) Genomic breakpoint regions (double-headed arrows) at 1p36 of cases 1–5, defined by FISH mapping. PRDM16 exons are shown in red, together with ATG start sites of PRDM16 and sPRDM16 in exons 1 and 4, respectively. The position of the bacterial artificial chromosome (BAC) clones (upstream of and spanning PRDM16) used as FISH probes to map the breakpoint regions of the 5 leukemias are shown in blue. (B–E) Predicted genomic rearrangement and transcription products for cases 1–5, defined by FISH, 5′-RACE, and RT-PCR. 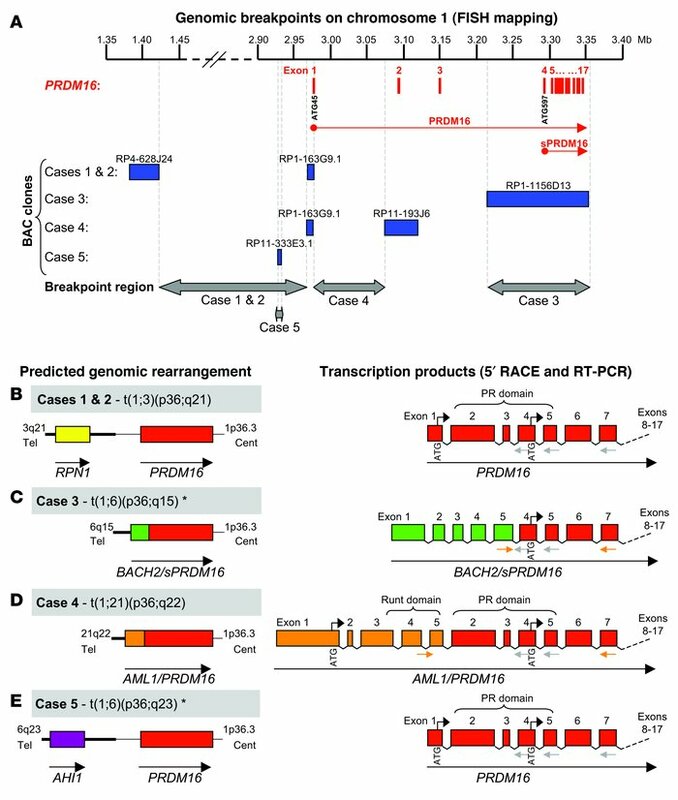 Grey and orange arrows indicate primer positions for 5′-RACE and RT-PCR, respectively. Asterisks indicate novel rearrangements.